VANCOUVER, BRITISH COLUMBIA--(Marketwire - April 24, 2008) - Sunridge Gold Corp. (TSX VENTURE:SGC) is pleased to announce new drilling results from the northwest extension zone of the Emba Derho zinc-copper-gold deposit. 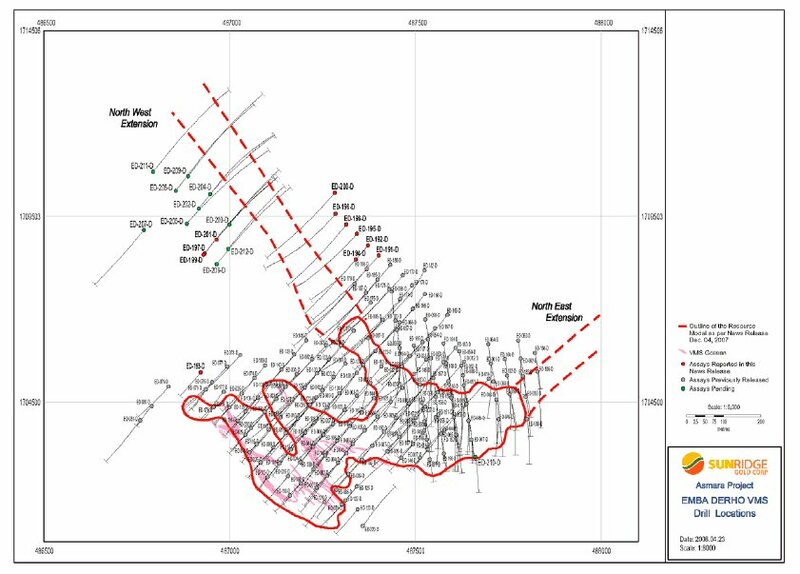 The results from 11 new drill holes have confirmed the extension of this zone by at least 400 metres beyond the current NI 43-101 indicated resource. These intercepts therefore have the potential to add significant tonnage and possibly boost the average grade of the initial Emba Derho NI 43-101 resource estimate announced on December 4, 2007. These results will be included in an updated resource calculation to be completed by Wardrop Engineering Inc. as part of a Preliminary Assessment study (scoping study). "The expansion drilling at Emba Derho has consistently encountered broad intercepts of higher grade copper mineralization outside of the current defined resource," says Sunridge Gold President and C.E.O Michael Hopley. "In light of the current price of copper, this could significantly enhance the size and economics of the deposit." The current estimated combined Indicated resources at Emba Derho contain 1.7 billion pounds of zinc, 735 million pounds of copper, 402,000 ounces of gold and 15 million ounces of silver, as reported in Sunridge Gold's news release NR2007-16 dated December 4, 2007 (see Note 1 below for summary of Indicated Resources at Emba Derho). The Emba Derho Deposit is one of four deposits delineated to date on the 100% owned Asmara Project, Eritrea. Two drills continue to operate on the Asmara Project focusing on delineating the oxide gold cap at Emba Derho. Geophysical surveys and geological mapping have identified the Northwest extension zone over a distance of approximately 1 kilometre. In addition, drill holes ED-192-D: 1.30 metres grading 15.20 g/t Au, ED-198-D: 1.1 metres grading 15.66 g/t Au and ED-200-D: 1.50 metres grading 12.95 g/t Au have intersected a high-grade remobilized gold zone over approximately a 200 metre strike length which could add additional value to the northwest extension zone. The reported drill holes have now extended the mineralization at Emba Derho by approximately 400 metres to the northwest. Drill hole ED-193-D was not drilled on the North West extension zone but on the western edge of the Emba Derho mineralized envelope; however it did not intersect significant mineralization. Drill hole ED-194-D was drilled on the North West Extension zone but was too shallow to intersect significant mineralization. Due to the fact that Sub-Sahara Resources NL is no longer a significant shareholder of Sunridge (see NR 2008-10 dated April 2, 2008) Michael Griffiths, Managing Director of Sub-Sahara has resigned from the Sunridge board of directors. Sunridge would like to thank Mike for his significant contributions to the Company over the past 4 1/2 years. Pursuant to the Company's shareholder approved Stock Option Plan 100,000 incentive stock options have been granted to Stephen Gatley who joined the Sunridge board in February. These options are exercisable for up to 5 years at a price of $0.93, which is the last closing price of the Company's shares prior to the grant date. The options granted will vest 50% six months from the date of grant and 50% one year from the date of grant and will be subject to any applicable regulatory hold periods. Sunridge Gold Corp. is a mineral exploration company focused on the acquisition, exploration, discovery and development of precious and base metal projects. The Company is currently conducting exploration on the Asmara Joint Venture Project in Eritrea. The Company has 62.1 million shares outstanding and trades on the TSX Venture Exchange under the symbol SGC. For additional information on the Company and its projects please view the slide show on our website at www.sunridgegold.com or call Don Halliday or Greg Davis at the numbers listed below. 2. All drill holes reported are diamond drill holes. 3. Drill intercept lengths only are reported in the text and tabulation; currently there is insufficient information to estimate true widths. 4. A Quality Assurance/Quality Control program is part of the drilling program on the Asmara Project. This program includes chain of custody protocol as well as systematic submittals of standards, duplicates and blank samples into the flow of samples produced by the drilling. 5. A description of the geology, sampling procedures, and the Company's laboratory Quality Assurance/Quality Control procedures are as described Emba Derho Project, Eritrea - Mineral Resource Estimate" with an effective date of November 30, 2007 was prepared by MSA Geoservices (Pty) Ltd. ("MSA") an independent and internationally operating geological consultancy firm based in Johannesburg, South Africa. The report dated January 11, 2008 was prepared on behalf of the Company in accordance with NI 43-101 requirements by Mike Robertson, MSc, Pr. Sci.Nat, MSAIMM and Mike Hall MAusIMM both of MSA. 6. Samples are prepared at African Horn Testing Services (Eritrea) and analyzed at Genalysis Laboratories (a NATA registered laboratory) in Perth Western Australia. 7. The Qualified Person responsible for the release of this exploration information is Michael Hopley, President and Chief Executive Officer of Sunridge Gold Corp.